The boy barely contained a groan. Fun to make? “This is going to be more difficult than the last time, because you have to upset the middle. What you need is this sort of shape…” Karl quickly drew it on the floor. All drawings are incorrectly scaled – for clarity. 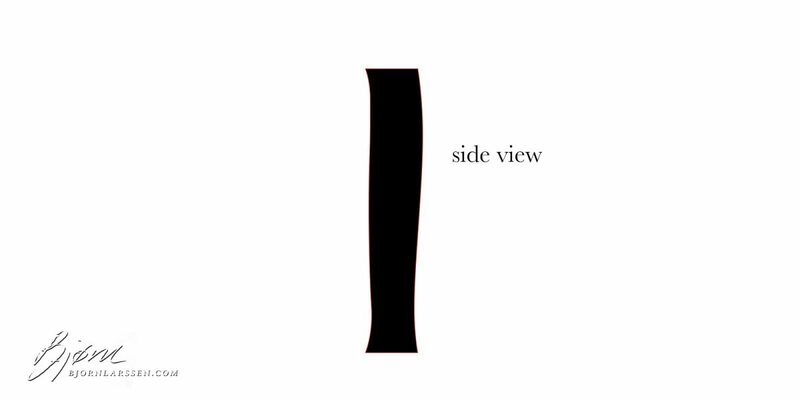 Look at the drawing sideways – no, the other sideways – then imagine an anvil on the bottom and a hammer striking the iron from the top, as indicated with arrows. Gunnar expected his father to cut another piece, but Karl heated the metal up, now more evenly, then brought it back to previous shape so fast that the hammer became a blur in front of the enchanted boy’s eyes. When the flattened stock was ready, Karl slowly dipped in the water tank and steam erupted, hissing. Karl cut another chunk of steel with a metal saw, then handed it to the boy. Gunnar’s first attempt bent the metal in half. 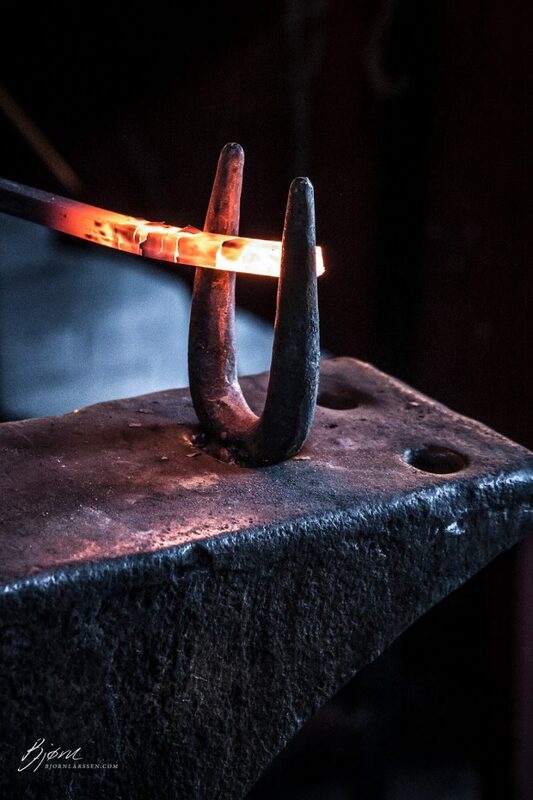 Without a word, Karl took the tongs from Gunnar, turned the steel around, struck it just once, and handed the tongs back, the metal flat again. So that was why he kept turning it around! Gunnar continued, again and again, biting his lip in concentration, sweating under Karl’s gaze. Nevertheless, no matter what he did the effect wasn’t the same as that of his father’s work, producing a shapeless object that Gunnar found very upsetting indeed. Gunnar immediately became nervous, barely able to stop himself from nervously glancing at the door leading back to the kitchen. “Go on,” said Karl. 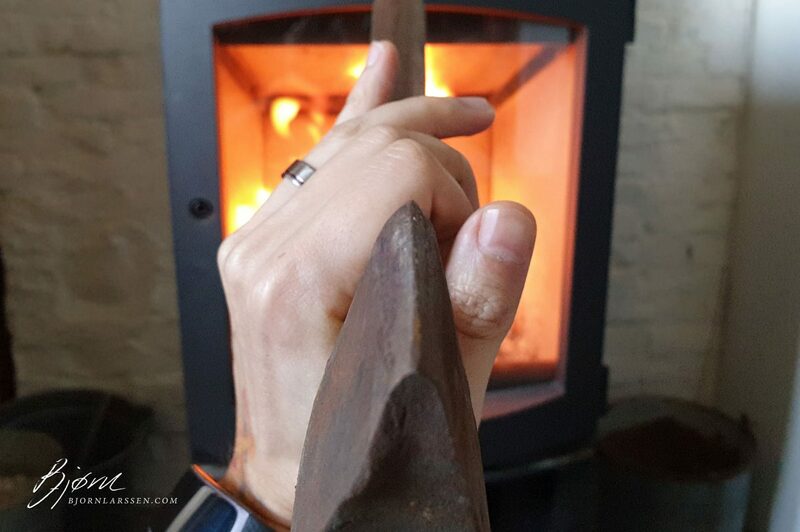 “It’s Bjarni again…” He stepped outside to speak to a client, who brought an axe over for resharpening. As they haggled about the price, Gunnar continued his attempts, until the chunk of steel was bent in all possible directions, resembling some sort of worm rather than the elliptical shape his father produced. Tears appeared in the boy’s eyes, but he was too determined to give up. He heated up the whole piece and removed the wonky upset. The sides were flat now, but the whole chunk bent out of shape again – just in a different way than before. “I will never learn this,” Gunnar mumbled to himself. He thought horseshoes were easy to make. Gunnar did as instructed, then looked at the chisel doubtfully. 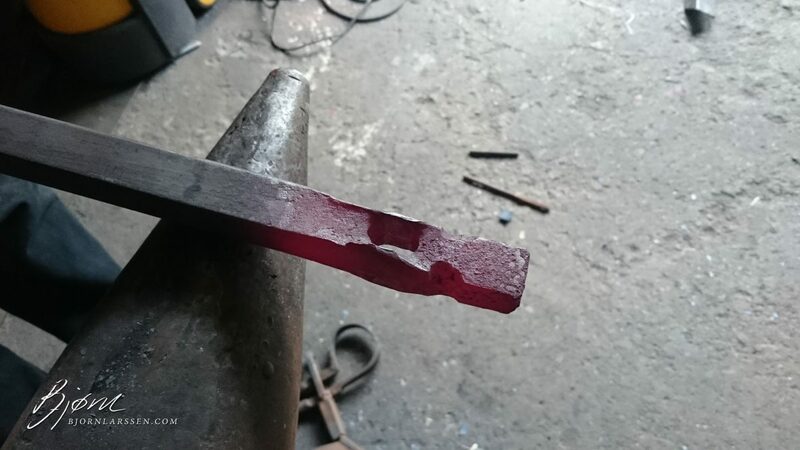 This used to be sharp at some point, officer, I swear… I don’t forge anymore, but took some of my favourite tools home as a keepsake. As you can guess, this one is quite old. “Aye,” said Gunnar, who didn’t. He followed the instructions nevertheless and the result was, at least in his eyes, outstanding. He could practically feel himself turning into a real blacksmith. Maybe he wouldn’t need five years of practice after all! Oh, of course, thought Gunnar, angry with himself. His moods were volatile, but at least today he felt happy some of the time. It was a feeling he rarely experienced. Photo: Dorota Kozerska. 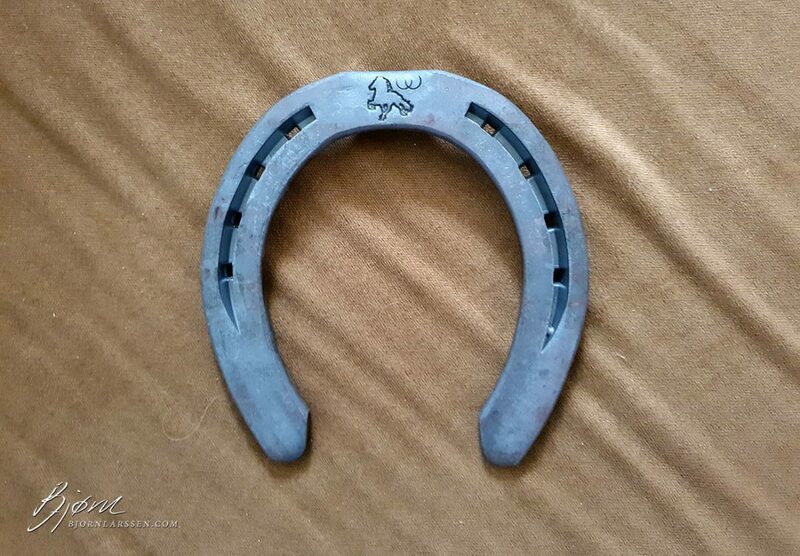 This isn’t a horseshoe, obviously. The dark chunks stuck to the metal are iron oxide mixed with coal dust – it needs to be removed (explanation further). “We’re almost done,” said Karl, patting Gunnar’s head. “Only the holes left. You’ve done a great job! And your face is all dirty. That’s good. 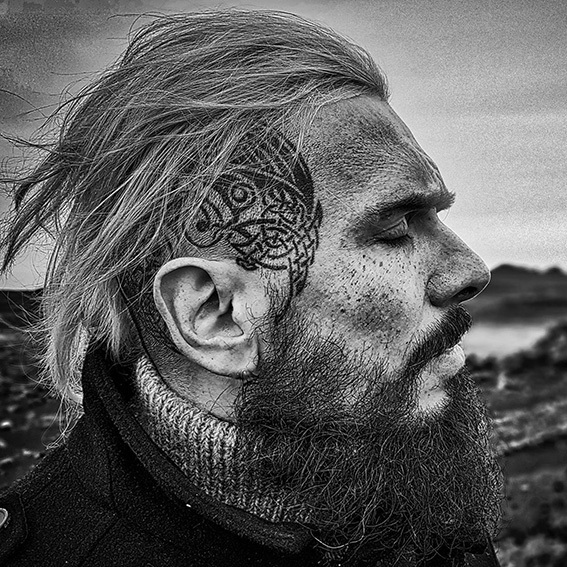 Means you’ve been working hard.” He licked his blackened finger, dipped it in the bits of dirt covering the anvil, then drew a moustache on Gunnar’s face. “Do mine now,” he said, and the boy did so, laughing, then happily grabbed his horseshoe, deceptively black, and burned his hand again. Gunnar nodded, his hand still in the tank, and watched Karl clean the horseshoe. It didn’t look that different to him – just dirty, dark-grey surface. But if father said so, it had to be like this. The unfinished, undecorated, hole-free, but more or less correctly shaped first shoes I’ve made during my first course. As you can see, those are very different from the model I described, but that’s as gleaming as they get. For a decorative horseshoe I’d use beeswax finish which would keep it rust-free for many years – and make it nearly black. Karl opened the door and let Gunnar through. “My son,” he said, as if Gunnar needed to be introduced to his own mother. Sóley’s lips formed a thin, white line, but she said nothing. Gunnar’s bewildered gaze wandered between the two faces, one angry, one defiant. He had an odd feeling that something wrong was going on, as if he got stuck in the middle of a silent wrestling match. Gunnar opened his mouth, but no sound came out. That was too exciting to put into words. 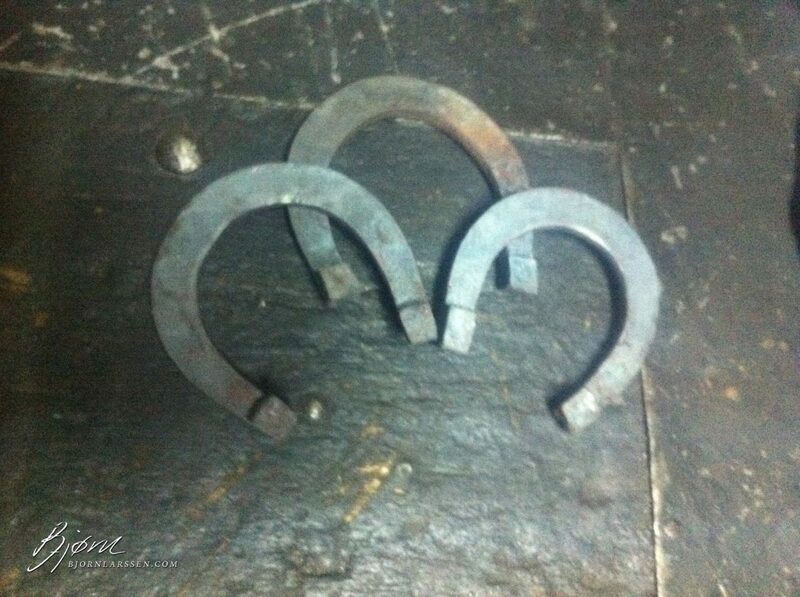 No five years of making horseshoes after all! Sóley threw the ladle on the floor and stormed outside, slamming the door behind her. Read about Gunnar’s future in Storytellers, my first novel, available for preorder now, release date March 28.